The disciples did not understand the significance of their mountain top experience with Christ. Jesus stood with Moses and Elijah in a real life vision of the Law and Prophets being fulfilled in the person of Christ. There they were, yet, all they could manage was a feeble response to this wonderful event. They had not been listening. When faced with difficulty, sorrows, or grief, Christians should consider the teaching of Jesus. Christ is the fulfillment of all Moses wrote in the Law and everything the prophets foretold of God’s plan for salvation. As we listen to our Lord Jesus, read his gospel, and pray in his name, God’s promises for life in his kingdom also become a real life vision of God’s mercy and grace. Jesus truly is God’s beloved Son. 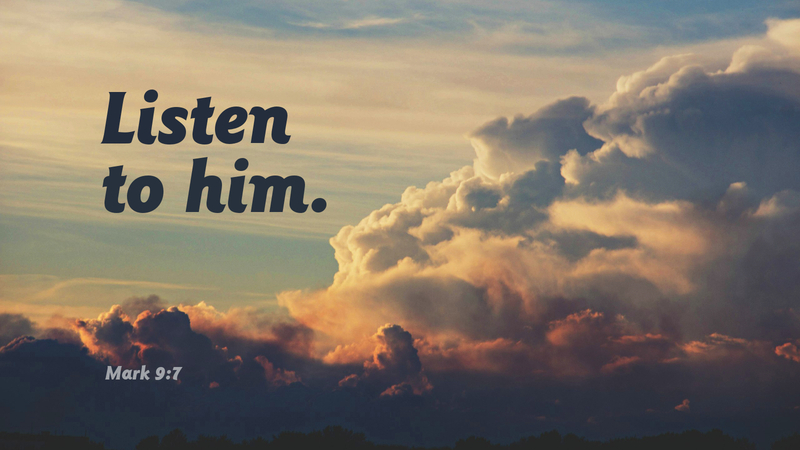 Listen to him. Prayer: Father, help me respond in faith to the words of my Lord Jesus. Amen. Thank you Pastor for your words of wisdom. Many times we hear how wonderful it would have been to walk along with Jesus and His disciples, forgetting what they endured. We have so many conveniences today that keep us away from our walk with our Lord. How often do we take of our time to share God’s word. When the opportunity arises, what do we do? Even acts of kindness towards someone can show the love of Christ through us. We need to be humble and bold in our walk.